I’ve been guilty of only using cranberries for a sauce to go with turkey. After Thanksgiving I had some left and rather than freezing them I wanted to use them differently. The Cranberry orange muffin at Starbucks was my inspiration but rather than make muffins, I wanted to make a loaf. I found this recipe on the internet and its my new favourite cake! It really wakes up the taste buds! It has a zingy, zesty taste. Orangey with tart little bursts of cranberry cutting through the sweetness. It’s like a little burst of sunshine in your mouth! As well as tasting good, this cake only has a little butter compared to other cakes so it’s not so high in fat! 250 gram plain (all-purpose) flour. 1 & half tsp baking powder. 200 gram sugar (I use unrefined). 150 ml orange juice (from about 1 and half oranges depending on size). 60 gram unsalted butter, melted. 125 gram fresh cranberries, rinsed. Preheat oven to 180 C, 350 F, Gas 4. Base line and grease a loaf tin (mine was a 2 lb tin). Weigh flour, baking powder, soda, sugar into a bowl and give a little whisk. Add melted butter followed by the egg, zest and juice of the orange. I used my mixer but it turns out fine if you just mix with a wooden spoon and some elbow grease! Fold the cranberries in by hand. Pour into prepared loaf tin. Let cool in tin on a cooling rack for 10 minutes before turning cake out of tin to finish cooling. This entry was posted on December 5, 2011, 10:24 and is filed under Baking. You can follow any responses to this entry through RSS 2.0. You can leave a response, or trackback from your own site. 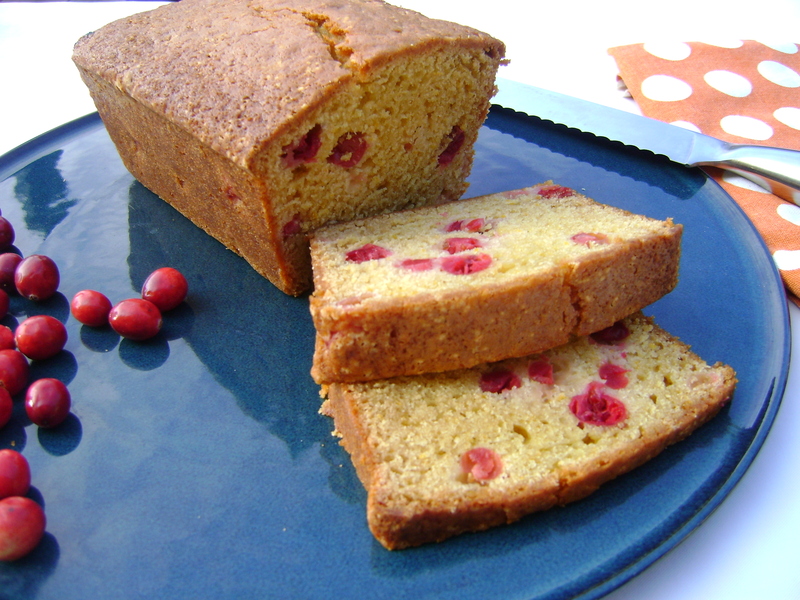 I love cranberries and try to freeze several bags while they are in season – your cake looks perfect, lots of citrus and not too sweet.